Ben Charlesworth, after a successful season, continued his rich form, scoring 59* for Gloucestershire 2nd XI vs MCC Combined Universities, followed by an impressive 102 for South West England v London & South England in the ECB’s Super 4’s U17 Festival, and selection for the English Schools Cricket Association (ESCA) XI vs MCC Schools XI at Lord’s – a fabulous achievement! Not to be outdone, Ben’s younger brother, Luke Charlesworth, was selected a year young for the South & West of England U15s for the annual Bunbury Festival in August, followed by a fixture against West Indies U15. Within his own age group, he won the best ‘all-rounder’ award, following some excellent performances at the Ampleforth County U14 Festival, including 80* off just 29 balls against Northumberland U14. Harrison Ward was selected to play for an England U19 ‘Invitational XI’ vs India U19; top scoring with a watchful 69 runs in an impressive innings victory for the ‘Invitational XI’. Unfortunately, Harrison suffered a scaphoid fracture the following week; curtailing his season and preventing him from captaining the South West of England in the ECB’s Super 4’s U17 Festival. 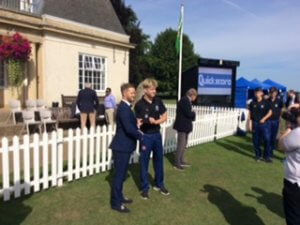 Elsewhere, Jamie Curtis completed an apprenticeship with Gloucestershire CCC and played regularly for Gloucestershire Academy; Rory Hipwell continued his recovery from injury, playing a number of three day games for Hampshire Academy and Hampshire U17s; while Tom Powell put in some impressive performances for Oxfordshire U17s. Further down the Club the future looks very promising, with Kunal Barman captaining Gloucestershire U14 and contributing with both bat, including scores of 74 and 56 against Dorset U14, and ball, including figures of 4/24 against Hampshire U14. 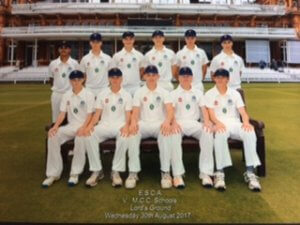 While Jack Barrett was selected for Oxfordshire U14s tour of East Anglia. Stanley Brown and Alex Horton, who have both recently joined the School in the Shells, played regularly for Gloucestershire U13s and Wales U14s and U15s respectively. Alex had a particularly impressive season; scoring half-centuries against no fewer than eight other County sides! Alex also played several games for the South & West of England U15s, but just missed out on final selection for the Bunbury Festival. However, these performances earned him an Academy contract with Glamorgan – a remarkable feat for a 13 year old! 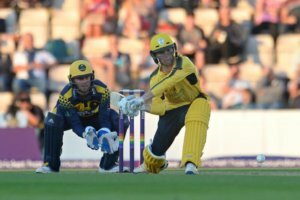 Finally, of our OSE, 2015 1st XI captain Calvin Dickinson broke into the Hampshire NatWest T20 Blast side in August, scoring 51 off 24 balls against Kent and playing in the competition’s ‘Finals Day’ at Edgbaston, and made his County Championship debut for Hampshire against Middlesex in September. Miles Hammond was awarded a further contract with Gloucestershire CCC and played regularly for their 2nd XI. Joe Barret continued for a second season with the MCC Young Cricketers, scoring a century against Lancashire 2nd XI and, 2016 1st XI captain, AJ Woodland, played regularly for Sussex 2nd XI and Buckinghamshire. All in all, a very busy summer for many in the Cricket Club, though eyes have already turned to next summer, with winter training well under way in preparation for the 2018 season!